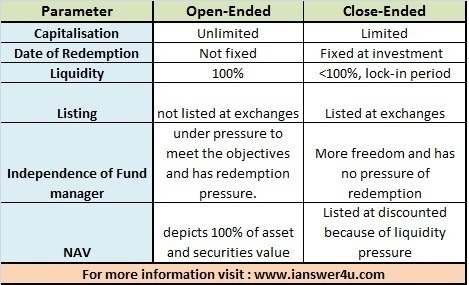 What are open and close ended mutual fund schemes? When a mutual fund scheme has no entry date and exit date barriers it is said to be an open ended scheme as any investor can join and invest in the scheme whenever he wishes to. Thus in case of open-ended mutual fund schemes, the units of the schemes can be bought even after the New Fund Offer (NFO). An investor can leave the scheme by selling his units at Net asset Value(NAV), which are declared by the fund. A close ended mutual fund is the one, where the offer to invest in the newly launched scheme is open until a specific date after which entry and exit are not allowed. There is an average lock-in period of 3 to 5 years in most of the close ended schemes. Any investor who wants to exit a close ended mutual fund scheme during the lock-in period will be able to do this only by selling them on the stock exchanges if he finds any seller or by any way that is mentioned in the mutual fund scheme's offer document. Sell and purchase of units in a close-ended fund can be done through a broker, just like we deal in stocks. This exit feature may or may not be available in certain schemes and may or may not be allowed according to the rules of the country's stock exchange regulator. It is true that open-ended schemes offer more liquidity as compared to close ended funds but in most of the cases returns of close ended funds are better.in close ended funds, you get the advantage of both dividend payment and capital appreciation. Which mutual fund option is better: dividend or growth?